A unique configuration makes Formula’s latest offering a cruiser and a day boat. There was a time, and it wasn’t all that long ago, when a bow rider was distinctly a West Coast thing. An open bow area on a sportboat that pulled most of its duty on the Colorado River, for example, made perfect sense. But in places where it tends to rain in the summer—pretty much everywhere but the Colorado River—even a mostly unused cuddy cabin in a sportboat made better sense for people and gear that needed to be out of the elements. 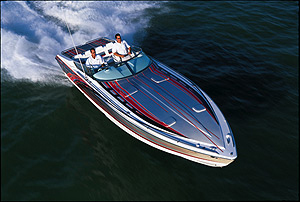 Typical of a Formula, the 350 CBR boasts sleek sportboat lines. 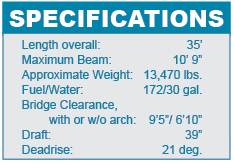 The traditional compromise in models 25 feet and longer has been a mid-cabin layout with an open bow. 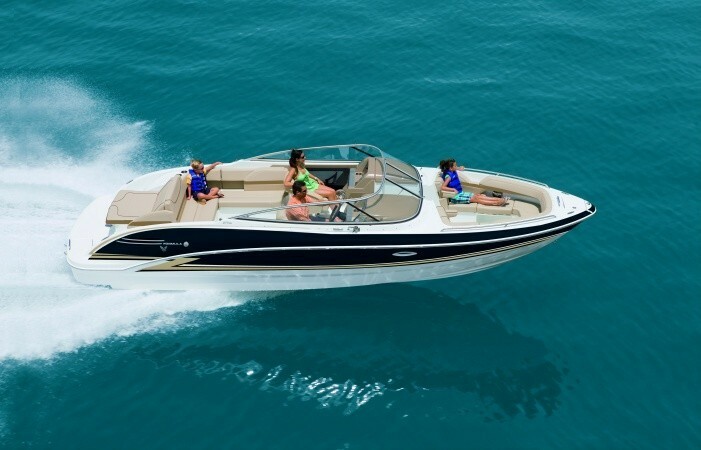 Think of a mid-cabin bow rider as a closed-deck boat with a hole cut in the front third of the deck to open up the bow area. A workable solution it is, but like all compromises the mid-cabin/open bow format has its drawbacks. Most notably, they are a cramped cabin and a stingy open-bow area. Of lesser and far more subjective note, the creation of that format tends to spoil the lines of what would be an otherwise pretty closed-deck boat. 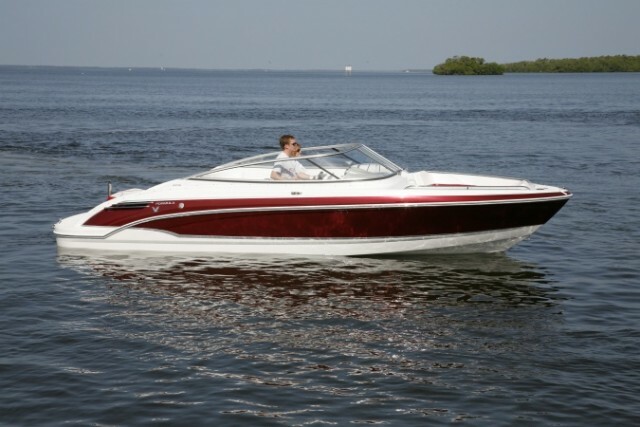 For several years, Formula Boats/Thunderbird Products in Decatur, Ind., has been getting demand for a large, open-bow model. 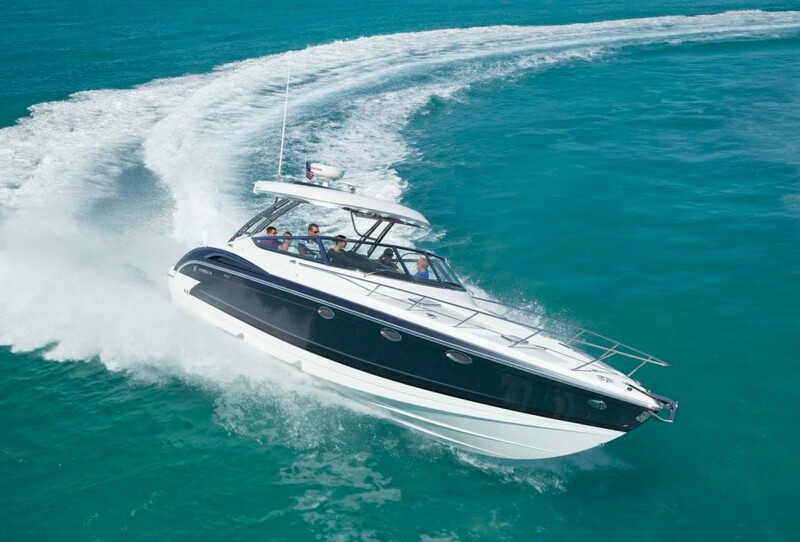 But neither Formula’s exclusive designer John Adams nor the Porter family that owns and runs the company wanted to go with either a pure bow rider or a mid-cabin offering with an open bow. Instead, the folks at Formula decided they wanted to create a hybrid that blended the exceptional open space of a 35-foot-long bow rider with uncommon cabin accommodations. The offset walk-through to port is the key to the 350 CBR’s innovative design. Enter the Formula 350 CBR. 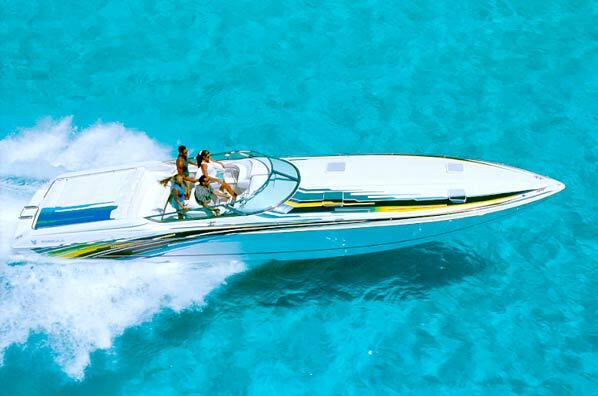 “CBR” stands for “Crossover Bowrider,” and the new model essentially takes the elements of the Sun Sport, Super Sport, and Performance Cruiser lines and blends them into a bow rider format. “In some ways, the 350 CBR is no different than any of the successful models that Formula has introduced over the years,” said Adams. “You can expand on existing models you have and you will end up with an extensive product line. The Porters are more comfortable with developing niche products, which is how the Sun Sports and Super Sports came about. That gives us the opportunity to stay light on our feet and explore new possibilities. 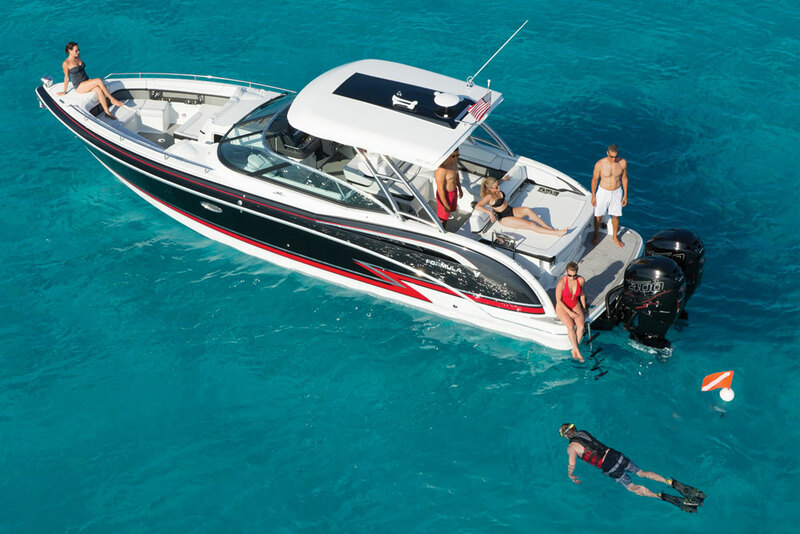 Unlike most mid-cabin models with open bow areas where the walk-through runs down the center of the boat, the walk-through for 350 CBR is on the port side. That allowed Formula to keep the Sun Sport and Super Sport-like cockpit amenities and layout, build a generous cabin belowdecks, and create a large open-bow area. “What we’ve done is convert a great day boat into a great day boat with excellent cabin accommodations and an open bow,” said Adams. Formula devoted almost one third of the 350 CBR’s belowdecks space to its cabin. The cabin, which takes up roughly one third of the boat under the deck, is accessible through a door in the helm station console that opens to three solid wood steps down to the main open area, featuring a woodgrain-finish floor. A double-wide lounge, cedar-lined hanging locker, and AM/FM/CD stereo changer are to starboard, and galley drawers, an HDTV/DVD combo, and storage with a wastebasket and paper towel holder are to port. The cabin’s mini-galley includes a microwave oven and a sink. A refrigerator is optional, as is air-conditioning for the entire cabin. Forward to starboard is a stand-up head locker with a sink, a shower, and a porcelain head. All the way aft is a full-size berth with a memory-foam mattress. Like its Sun Sport and Super Sport siblings, the 350 CBR boasts two-person seating at the helm station, although the dash has been redesigned with new panels and cleaner layout for the Livorsi instruments and controls for the cockpit stereo. Additional cockpit seating includes a starboard-facing bench opposite the helm station and an L-shaped lounge behind it. The back of the L-shaped lounge also provides the foundation for the backrests of a two-person rear-facing lounge above the integrated swim platform. Up front, the bow includes yet another forward-facing two-person lounge seat as well as a U-shaped bench. A filler cushion set in place between the lounges creates a giant sunpad (there’s also an option for a drop-in table), and a draining bow cooler also is standard. 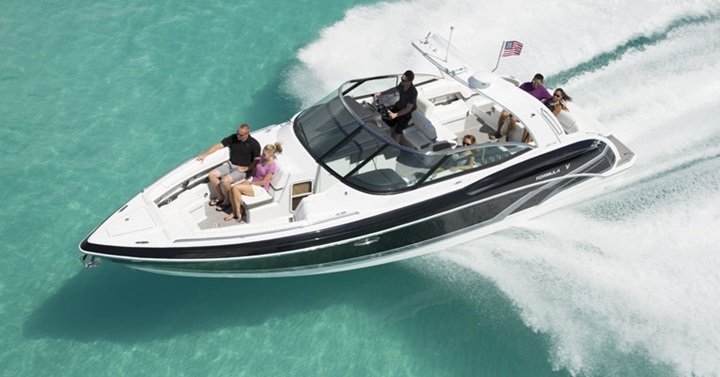 Formula has not yet announced what twin-engine propulsion package it will use for base power, but the most likely choice is going to be a pair of MerCruiser 496 Mag HO engines. Just as likely, the builder will offer a twin 525 EFI engine setup from Mercury Racing as an option.